On July 5th 2007 my nephew came to my room and asked me to go outside and look at something. I asked him what, but he responded he’s not sure, need to look for myself. This was daylight around 8 P.M. I went into the backyard with him and he pointed in the sky. 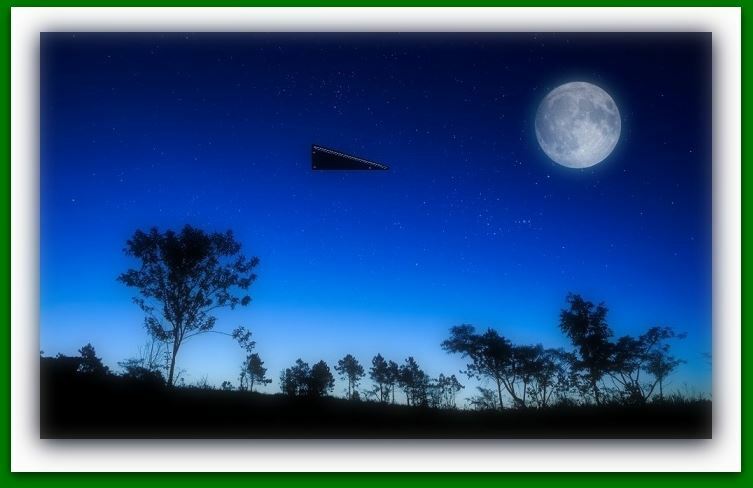 I saw a profile/underside of a large black triangle motionless and hovering beyond the roofs of the houses. The shape was similar to a manta ray except the outer shape was a near to perfect triangle with straight lines. The under side had 3 red lights towards each corner, this appeared to be propulsion. I could see it pulsated more to a white intensity color as it moved later on. From my view the object was half the length of a standard house looking over the roof line, hard to determine it’s exact distance or size. Had to either be very large and real far away, or just large and closer. I’ll estimate it at maybe 100 feet wide being the closer/smaller size because I could see some details in the lights/propulsion. There was no observable windows or doors anywhere on the craft, looked totally smooth throughout. I affixed my hand to the side of the porch and used my thumb to determine if I saw any movement whatsoever, the object did not move with the wind like a balloon or a kite would do. We stared at it a good while and it started getting dark. I was looking at the clear night sky and the moon when at the south-east side of the moon I noticed a red light appear. As I watched this light it got larger, I told my nephew and we watched it come all the way into earth’s atmosphere and join up with the first triangle. It turned out to be another triangle the same. It took this triangle less than a minute from deep space to our location. At this point I realized that I was truly seeing a UFO..and in that sense I mean something not from earth. When triangle two got to triangle one, triangle one moved all erratic, then triangle two did something similar. Triangle one then darted off way into the distance, up down and all different directions and appeared to even come back to the same position as was. The speed and maneuvers were incredible. Triangle two did some erratic movements then shot off back into space, following the same pattern it came from. Again it took less than a minute and was totally out of sight on a very clear night sky. Triangle one then started to do what appeared to be a search pattern. Slow hovering and can see the triangle tilting in different directions as it moved around. After around two minutes of this triangle one darted off into space the same path triangle two took. Also out of sight less than a minute. I have no video or images of this event. I did not want to leave and miss anything plus most likely nothing was charged. Always assumed it was possible other life exists than our own…we exist after all. I believe my nephew and I witnessed the proof that it’s not only possible but a reality. NOTE: The above image is a rendering.